Limerick and Cork councils have yet to release their figures for storm damage. THE COST OF the recent storms has run to €36.8m for Clare County Council. It had already submitted a report to government based on storms in December and January, but has revised the figure upwards following the most recent bad weather. It says that the €36.8m is the estimated cost of the storm damage to the public infrastructure it manages. In order to reach the figure, the council analysed multiple coastal locations affected by the storms and bad weather on December 26/27, January 3, January 6 and February 1, as well as non-coastal locations affected by localised flooding. Its initial report prepared on January 10 said the costs added up to €23.7m, but a new report due to be presented to Clare County Council members this evening reaches a higher figure of €36.8m. This new figure takes into account further damage reported along Clare’s Atlantic coastline and at some locations along the Shannon Estuary on February 1, as well as the “undoing” of some remedial flood defence works that had been carried out in January. A copy of the updated report will be sent on to the Department of the Environment, Community and Local Government after the council members examine it. Some of the largest figures for remedial works come from Lahinch (€6,064,689) and Cloughaninch, Quilty (€4,716,945). The council said that the total costs of €36,801,284 include a contingency sum equivalent to 10 per cent (€3,345,571) to “cater for design costs, damage reports not yet available and a variety of other elements”. Email “Cost of storms to Co Clare : €36.8 million”. 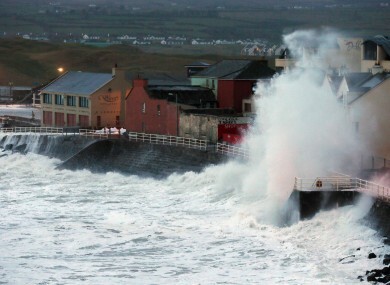 Feedback on “Cost of storms to Co Clare : €36.8 million”.